Upon arrival we were allocated a room which was dark, unclean, extremely small and disappointing in all respects. We asked to move which created an immediate problem, the Thompson rep was hopeless, in the end we had to negotiate and deal with the owner George. Eventually after several hours we were given an upgraded room. We enquired about the costs and other terms and were simply told don't worry, no worries the management will sort it. Upon leaving, had to pay a huge "supplement" in cash (euros) notwithstanding our protest, rep was hopeless and no receipt given. Made to feel really unwelcome and uncomfortable. Would not recommend this hotel - staff unhelpful, on-site shop extremely expensive and necessary to hire a car for the duration of the holiday due to the hotel's location up a very steep hill. Overall, very disappointing and would avoid at all costs. The hotel frankly is more to the standard of a second-rate youh hostel at best. Do not go! Just spent a week at LIBERATOS VILLAGE and the location on a hill could be a problem to various people. Lassi is beautiful and there are many lovely places to eat during the day and evening. Its got a lot more expensive with the exchange rate though. LIBERATOS VILLAGE looks beautiful once you arrive but the standard of cleanliness is a big issue. We have the toilet bin emptied twice in seven days. The sheets changed after four days and NO towel change at all in the full week. Urgh !!! and not even a pillow slip for your second pillow. Urgh !!! As for maid service there isn't any at all. I fully understand that it is classed as self catering but your not even provided with a brush, pan or mop to clean with. Totally wrong view to take. The bar and shop are so overpriced that you need a bank loan to get a litre of milk. When you get in the basic rooms there is a full A4 piece of paper stuck to the inside of the door telling you the do's and don'ts. Also that there is video recording taking place in the garden to stop people going on the grass.... MI5 could learn something. It would be funny if it didn't spoil your holiday from the off set. So to put it in context the place of Lassi is beautiful and the LIBERATOS VILLAGE location is a little difficult to get too, but if you are fit and willing to walk up a large hill its nice, with really nice places to eat out at. However saying that LIBERATOS VILLAGE is dirty and very unclean. Forgot to mention the mouse and cockroch dropping in the cupboards.... double URGH. We know that people just shrug their shoulders and say "well it is Greece", the rep did. In these hard times we feel that is not enough and we paid good money to be treated like fools. LIBERATOS VILLAGE gets a big thumbs down from us and we will never stay there again. PLEASE THINK CAREFULLY BEFORE BOOKING HERE AND STAY SOMEWHERE CLEANER INSTEAD. Just returned from a fantastic fortnight at the Liberatos Village, glad we never saw any of the reviews before we left otherwise would have seriously been put off. We were a little dubious when we were taken to the hotel and saw the hill but the view from our apartment was glorious. The apartment was basic, but no more so than any other apartment we've stayed in. All we want to do is sleep and chill in it, it's not where we hope to spend most of our time on holiday - if we wanted to do that then we'd book a villa! The kitchen was again basic but we ate out every day, but there was enough for us to do the basic cooking we normally do on a S/C holiday. The bins were emptied every other day and the bedding and towels were changed 3 times, more than enough. We had no hot water one day but that was fixed by the time we returned. We managed to walk up the hill at least once a day, to be honest neither of us are fit and are both well covered but if we could do it after a day out and a meal then any but the old or infirm could do it. It at least meant we did one form of keep fit a day, which is never a bad thing and it didn't detract from the holiday. The pool was absolutely superb - always clean - in fact the cleanest pool I've ever used. Never any debris on/in it and rarely any insects either. Fotis and George, the barman, were both friendly and helpful and Fotis did a grand job of running the complex. His father (George [not the barman]) was also friendly. The bar ws no dearer than any of the restaurants in Lassi for drinks, it is not a cheap Greek island generally. The BBQ was good value at 5Euros per person and Fotis and his father entertained with Greek dancing. The only night we heard any noise from the bar area was BBQ night - we heard more carrying up from Lassi than the bar area. The dog did wake us a few times, but as it isn't their dog there isn't much point complaining. Yes, the supermarket was sometimes on the expensive side - but then we never bought anything from it, preferring to buy from Lassi, the option was ours. This is really a trifling complaint to make - we have been on enough S/C holidays to know that any 'attached' supermarkets are dearer than others. The situation of the apartments means you can walk into Lassi or Argostoli easily, Argostoli having the better selection of shops and eateries you would expect from the capital. 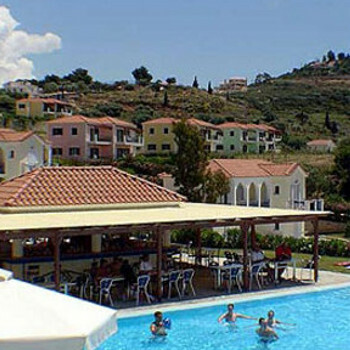 As a family group two adults and two young boys stayed for two weeks at the Liberatos Village, Lassi,Kefalonia. This was our second visit to the resort having previously visited Lassi in 2004 but at different accommodation. The Liberatos Village is set on a hill but the views are fabulous. We had a lovely room which was clean on arrival and cleaned twice a week. Bins emptied everyday. We had to pay for air conditioning but it was well worth it because it was so hot. The kitchen is basic but everything was very clean and we didn't have intentions of cooking anyway. The pool area is very nice. You did have to get up early if you wanted a bed with an umbrella which was a must for us but if you are not bothered about umbrellas you could still get a bed. The food around the pool was reasonably priced and really nice with a wide variety to choose from. The shop though was very expensive so we only used it in emergencies. The hill leading down to the village is fine going down but we were slower walking back up at night. We didn't find it a problem because we enjoyed the exercise but a taxi is only 5 euros if you really don't want to walk. I would visit these apartments again. The Liberatos Village is adequate accommodation it has exceptional views and beautiful sunsets, since I have stayed at many Greek resorts I was amazed that we had hot water for the whole of our 2 week stay except for 1 night, the linen was changed twice in the 2 weeks. We did have an extra pillows but one had blood stains on which we did not use, we had to wade through water after every shower there was loads of ants/wasps, wires with tape on but none of this bothered us because we were in Greece and as far as we are concerned it is just somewhere to sleep. The shop prices in the Liberatos Village were extortionate and how the owner can justify his prices I do not know. The dreaded hill, although we can understand that it maybe difficult and off putting for some people we actually enjoyed the walk up and down especially after having one of the gorgeous meals in Lassi. We even pushed our push bikes up this hill because the bike owners shop was not open (it was there siesta time). When the news started to filter through regarding XL airways we were on a boat trip and we were not duly concerned because we knew that alternative travel would be found eventually to get us back home even if it meant that we had to stay longer (after all it was a lovely place and lovely weather). What a shame this could be such a wonderful resort, it has wonderful views, lots of outside space which gives a sense of privacy, its high location provided a cooling breeze. What let it down was the lack of customer focus/ consideration by some of the staff and the manager. Our apartment was 50yrds away from a tied dog that barked and whinned for the whole of the 14 days. we complained to rep and manager and were told " cant do anything not our dog" - so they obviously knew what we were complaining about and as we walked away the rep asked if it was #x#x dog again !!!!! They borrow chairs and even after repeated requests/reminders from us they were never returned. The resort located centrally for beaches, supermarkets, buses, bars and restaurants but it is up a very long steep hill which could be resolved by the manager running a shuttle service. we were originally in a different hotel but got put here instead. so heres my review. 1/ Staff were excellent esp Thassos & Fortis. they knew our situation and looked after us. 2/ Apartments up a very steep hill and on a mountain. 3/ Hotel and grounds always clean and tidy, room very basic but clean. 5/ No entertainment and resort not very good. All in all i would not book this place if your old,cant walk far etc as its up a very very steep hill and is built on the side of a mountain. Our accomodation was nr the top of the property and very far from the pool etc. We stayed here 4 years ago and were happy to give it another go. Unfortunately it was not as good an experience. We had a 1 bed apt next door to the one we had previously. Last time it was a new block - same block this time but the apt was very tired indeed. We were only cleaned once in a week with one change of towels, no change of linen. We had problems with the plumbing in the bathroom. The drainage hole in the floor would overflow and the bathroom would flood. We complained and were told not to run the shower so much. We ended up having to switch the shower on and off between spurts of shampooing/shaving etc. We took it in good spirits and saw the amusing side. The fridge did not work properly. All food/milk etc went off within a day. We complained to the manager. He sent someone around who basically pulled it out, banged it and put it back. We didnt bother to complain again and just bought the bare minimum on a daily basis. The cleaning was non existent so we had to do that ourselves each day. The toilet bins were emptied though thankfully. Other people were unhappy with their accommodation and we had one of those "worse" rooms for the day on the day we left paying for the privilege. We thought ourselves lucky we had the apt that we did! It was however, beautifully quiet where we were. A real hike with a pushchair up a steep and long hill and several steps up to the apt with a heavy and tired 4yr old at night. However we were aware of that from previous. No good though if you don't like a physical challenge! Pool is nice and clean. On site shop is to be avoided unless you want to pay twice the price for your provisions. Good for the occasional milk/water emergency though. Bar area basic but clean. Pool bar food limited and not very appetising but fine if you like the usual burger/chips option - nothing remotely healthy. This is a basic accommodation and facilites and fine if you wish to just have a base to lay your head and do a bit of sun worshipping just dont expect any frills or extra from it. Its not the worse place we've been and having children now I guess we look for a little more. Very clean very nice one bedroomed apartment, two beds in kitchen/living area. Nice balcony(we were on first floor of 2) great views. Typically greek room basic but very clean and a bath ! (unusual for greek apts we have stayed in before)as well as the usual shower. Pool bar had very friendly staff and not too bad prices 3.00 euros for large beer 1.80 for soft drinks, food from pool bar was good and reasonably priced too, only the supermarket was a bit overpriced. All in all a great place to stay, although barbecue night (thursday) was a bit noisy pool bar music went on until 2ish - nothing too bad though.